Glimpse's mission is to share stories from abroad that encourage readers to understand and care about other cultures, changing the way young Americans think about the overseas experience, and challenging them to explore real life abroad. 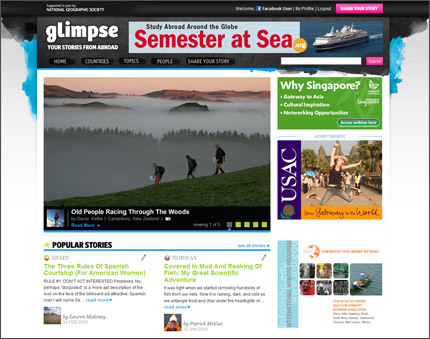 Supported in part by National Geographic Society, Glimpse looks beneath the surface of everyday life abroad by providing a forum where internationally minded youth can share their experiences and connect. When they came to us asking for new interactive features and a dynamic design for their target audience, we were excited to help. We're proud to announce the launch of their new site, Glimpse.org, which debuted after several months of collaborative efforts. Specifically, we helped Glimpse establish an initial design direction by providing mood boards, then helped them to think through content priorities and the user experience of the site. We then created a site map to illustrate the new architecture, annotated wireframes that described interactions and content requirements, and striking design comps that reflected their new brand direction. We built out front-end design templates and key interactions before passing it along for Glimpse for development. Learn more by visiting Glimpse.org.